The Android team gave their Gmail app a nice little update, which, among other things, now supports prioritized inboxes, along with improved methods of composing emails. And they're not even waiting for the Gingerbread release to roll this out. 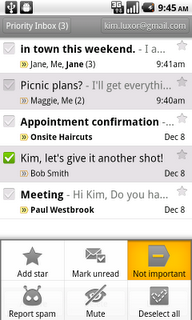 The prioritized inbox comes with new UI elements for determining on the fly which emails are or aren't important. Plus you can setup custom alerts or vibrations so that you know when a priority email has been received without even looking at your phone. As for improvements when it comes to composing emails, Google has made it easier to switch between replying to one or replying to all, allows you to send your emails out under a non-Gmail alias, or reply to emails in-line.